They don't come much more dark and twisted than this one�this little-seen movie is all that a noir fan could hope for. And more. 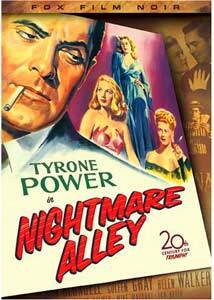 I first encountered the story in the Library of America's fantastically pulpy two-volume set of noir novels�there are some great ones in there, but William Lindsay Gresham's Nightmare Alley may be the pick of the litter. The film of the book would pop up at a revival house every now and again, and no home video release ever happened�until now. This isn't a classic film, a story for the ages, but it's dark and murky and freakish, exploring the worst aspects of our nature�it's just what you want in a film noir, and this one is a dilly. Tyrone Power stars as Stanton Carlisle, who is coasting along in a ratty bow tie as part of a cut-rate carny�but of course he dreams of grander things, and he's looking for his ticket to the big time. The cautionary tale that haunts Stanton throughout is the carnival geek�that is, a broken-down old rummy who, in exchange for the right amount of cheap whiskey and a place to sleep it off, performs an appalling act in which he bites off the heads of live chickens. (This being a Hays Code movie, all of this is more implied than made explicit; in some ways, though, that makes it even worse.) Stan chats up Zeena (an aging though still vital Joan Blondell), who's got a mentalist (i.e., mindreading) act that used to slay them; her partner, Pete, is too much a victim of the bottle to keep the act going, but they're keeping their precious and valuable code to themselves. So Stanton wants to find some way to get in good with them, while also chatting up the dishy Molly (Coleen Gray)�Stan is an operator, but he sure is dreamy. The story charts Stan's rise and his inevitable fall (it's no surprise that things end badly in every film noir), and he's a pretty horrid guy�he's always on the make, and hence we're asked to make some unsavory moral determinations about him. He tries to get Pete liquored up to share the code, but Stanton slips him a bottle of rubbing alcohol instead, ensuring Pete's death. Was this accidentally on purpose? Is Stanton a killer, or just a lowlife and a hustler? So we're in murky territory here, but Stan isn't entirely unredeeming, in large measure because those he encounters at even the highest strata are just as unseemly as he. Most prominent among these is Lilith (sly Helen Walker), a psychoanalyst who makes acetate recordings of her patients, arming her to the teeth with ammunition for blackmail. (Think about that during your next 50-minute hour.) But she's a sharp one, and her relationship with Stanton, though late in starting, may be the most venomous in this dark picture, as she tries to gaslight him late in the third act. I can surely see why many might not take to this movie, but I love this stuff, and Tyrone Power especially is great�he's at once charming and odious, and he always strikes the right balance. At his darkest there's still something endearing, and even when his Stanton is trying to be genuine, he can't shake the used-car salesman aspect of his personality. Stanton's world is cheap and tawdry from the jump, and even when he's the headliner, that aspect remains; toss in some terrific vintage footage of Chicago, and you've got yourself a sweet dark time at the movies. Image Transfer Review: The story bristles, but unfortunately the print used for the DVD transfer does not�picture quality here is awfully spotty, full of flecks and imperfections. And the images tend to get a little muddy�this is film noir, not film gris. Audio Transfer Review: Balance is a bit askew on the mono track, and that's addressed modestly on the stereo one; the transfer is certainly adequate, and the dialogue is audible. Circumstances over the years have kept this from being among the most popular or best known noir pictures, so this DVD is a very welcome opportunity to get acquainted with one of the strangest, darkest and most compelling Hollywood movies of the 1940s. For all its tawdriness, this one will get under your skin, and in some respects it's the best picture yet in Fox's film noir series. Fear the power of the geek.